Mildred Bruhn met her first great-grandbaby last week, a beautiful 10-month old named Alice whom Mildred promptly nicknamed "Bouncy-Bouncy" for her affinity for a bouncing swing. Ah, the stories Mildred could share with this child - about fishing northern Minnesota's lakes or playing high school softball or taking long road trips with husband Ralph - the two drove through every state in the continental United States except for Washington and Oregon. But Mildred, 84, is terminally ill. Cancerous tumors press on her brain, and a seizure felled her on Thanksgiving Day. She arrived at Hope Hospice earlier this month. Hospice staff members don't want Mildred's life to go uncelebrated and her stories to go untold. That is why 16-year-old Victoria settled into a chair beside Mildred one morning earlier this week and peppered her with questions about her life. Victoria will take the stories and photos Mildred and her family shares and, with Mildred's help, create a memory book for all of the generations of Mildred's family to come. 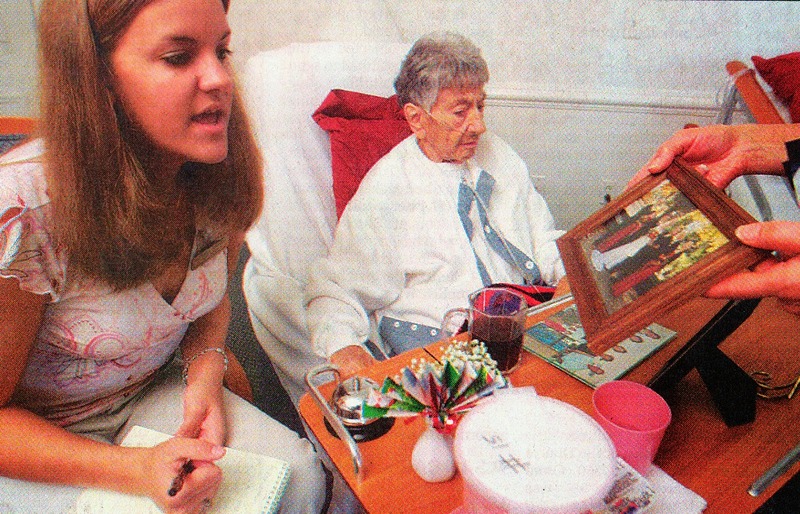 Hope Hospice started the memory book program about a year ago as a way for patients to leave their legacies. About 46 teenagers work year-round with patients who are interested in sharing their stories. Victoria, a Fort Myers High School junior who wants to become a teacher, learned about the program through her Girl Scout troop. She's done community service work before, but this is her first longterm project. "Do you have children?" Victoria asked Mildred. "We had three daughters and one son," Mildred replied. Son David died during childbirth. Mildred and Ralph raised daughters Deanne, Darlene and Delores, who goes by "Dede." "The Three D's," Mildred calls her girls. As the conversation between the young woman and the older woman continued, a picture of Mildred's life emerged. Mildred's husband, and daughter Dede, who was visiting from Minnesota, helped fill in the blanks. Mildred was born on May 29, 1919, and grew up in Hutchinson, Minn. She graduated from Hutchinson High School in 1936. Her senior portrait shows a pretty young woman with rosy cheeks and wavy brown hair clipped just below her ears. She played the piano and the cornet. About 20 years ago, she learned to play the organ as a way of rehabilitating the right side of her body, which was crushed in an automobile accident. Mildred married Ralph in 1941, and gave birth to Dede a year later. Mildred was a beautician, although her husband describes her primary job as "taking care of Ralph." Their daughters grew up and married and gave the couple seven grandchildren. Victoria looked through family photos that chronicled life's biggest events - grinning brides in long dresses, a portrait of her and her husband on their own wedding day, a snapshot of herself, Dede, Dede's daughter and baby Alice - the family's first four-generation photograph. Mildred's eyes drooped as Victoria interviewed her, a woman slowed by illness and age. But in younger years, Mildred was a woman who wanted to break the mold. In her closet at home she kept a baseball cap with the motto "Dare to be Different." "If someone told me to stir a cake like that, I'd stir it the other way," Mildred said matter-of-factly. Was that a value she passed on to her daughters? "No. They were taught to obey their mother," she replied. Dede nodded in confirmation. There is one lesson Mildred, a devout Lutheran, wanted to pass on to her family: "We cannot do everything by ourselves," she said. "It may get ever so rough. but there are always better days to come." Tears welled in her husband's and daughter's eyes, but they dried them and moved to happier thoughts - good times that they related to Victoria who jotted notes on a stenographer's pad. Victoria promised to return within the next few days and begin putting Mildred's memories on paper. Victoria said she had been nervous when she first started volunteering a few months ago. "I didn't know what it would be like," she said. But she's eased into her role. "It is just like talking to your grandparents and hearing their stories," Victoria said.